The topic of this review almost asks for trouble in the context of a Christ-centered gaming review site. Here we have an RPG in which the hero has \'666\' tattooed on his hand and the villains are a group of insane Christians. This is Xenosaga Episode II: Jenseits vot Gut and Bose (\'Beyond Good and Evil\'), a so-so RPG that has some serious anti-Christian themes. The \'Xeno\' franchise enjoys a long and interesting history. Several years ago a game called Xenogears was released that stirred up quite a controversy. I haven\'t played it myself, but from what I\'ve read about it I gathered that the main character was the reincarnation of the Biblical character Abel, and he went on an adventure which ultimately led him to confront and kill God (the entity was called Deus in the game, which is Latin for God). After the success of that game (which many people I have talked to believe is one of the greatest RPGs ever), the creators left their old publisher, Squaresoft (of Final Fantasy fame) and created Monolith Soft, and its flagship title Xenosaga, under the Namco label. Xenosaga was a prequel of sorts to Xenogears, though that is unofficial because Namco doesn\'t have the rights to the original game. Xenosaga easily got a failing grade on this site do in part to the game\'s potentially-offensive religious references. While Xenosaga Episode I didn\'t involve literally killing God like the original Xenogears did, there were still plenty of sacrilegious themes throughout the game. Other complaints about Xenosaga included the incredibly long cutscenes and the rather boring battle system. Now we have in front of us the third installment in the Xeno series, Xenosaga Episode II, and while the gameplay has been improved over the previous game, the themes have gone from vague references to Christianity to a much more explicit attack. Like its predecessor, the time you spend playing this game is about 25% watching the convoluted story unfold through hours of cinemas. Though the story is engaging, many less-patient RPG fans will get bored. Once you have sat through (or skipped over) a cutscene you finally get to play the game. The basic RPG formula is intact: the player enters a level, navigates around the place and solves a few smarter-than-average puzzles, fights random battles, and makes his/her way to the boss. The battle system has been refined some from the Xenogears era. The fights are still incredibly repetitive but are an improvement over the Xenogears combat system. At its core the combat is still turn-based, but one can \'boost\' characters when the boost meter is full, which basically amounts to having the boosted character \'cut in line\'. In other words, boosting a character makes him or her act sooner rather than later. Also, the part of an enemy that is attacked makes a difference in the amount of damage inflicted. There are three zones on most enemies that may be targeted, and if the player hits a combination of zones in the correct order s/he breaks the enemy\'s defense and can do extra damage if another character is boosted up to the next turn and attacks. It is a unique system and it keeps the battles from just being long sessions of two teams taking turns to hit each other. 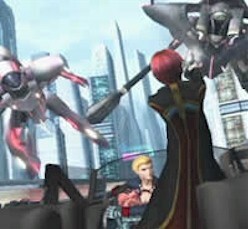 Occasionally the player also controls giant robots in battles. These have their own, simplified battle system which is identical to on-foot combat onto without the break-zones. All of this makes for gameplay which is more fun than average. However, the loading times make the transitions to battles take longer than they should, and there were portions of the game where I found myself not doing much more than walking back and forward through cities and watching cutscenes. These flaws, along with the fact that the battles do ultimately get repetitive, bring the score down from the heights its innovations would have taken it. Another problem is that this game is very short for an RPG. It would probably take most people 20 to 25 hours to beat the game. There are a ton of extra things to do to increase the experience\'s longevity, though. These \'global Samaritan campaigns\', of which there are dozens, involve wiping windows, delivering love letters, fixing roofs, and taking cats to the vet among other things. Unfortunately, its all as boring as it sounds. There are some cool rewords for finishing these tasks but it doesn\'t change the fact that the process for getting them is so tedious. The game\'s graphics are pretty enough. The PS2 is starting to show its age, though, and while these may be some of the best visuals on the system they still aren\'t mind-blowing. The environments are at least varied and interesting to look at. A few of them are quite cool, even. Unlike the last game, which confined the player to the tight corridors of starships, much of the game takes place in outdoor settings. Even the industrial areas are an improvement. Similarly, the character designs have matured. The characters look older (even though this game takes place literally minutes after the previous installment ended), and they aren\'t quite as deformed-looking. I\'m not going to beat around the bush when I say that the music in Xenosaga Episode II is terrible. Each level is accompanied by some awful piece of up-beat Japanese techno garbage that tempts the player to push the mute button on his or her television set. The voice acting is split between some characters that sound awesome and some that sound just as grating as the music. For the most part, your ears won\'t like you when you play the game. Regardless of the visuals or the sound, the game\'s main draw is it\'s story. As I have said above, the narrative is interesting but more than just potentially offensive to Christian players. The tale focuses on a character named Jr., who was a side character in the last game. Jr. was the six-hundred-and-sixty-sixth unit created in an army of clones designed to battle an evil entity called U-DO. The game goes in depth to explain Jr\'s history as well as that of his evil twin, Albedo (they were conjoined twins, with Albedo on the right and Jr on the left, which is interesting considering that the left and the number 666 are both associated with Satin, and this is the good-guy who has these traits). Eventually, this personal conflict is absorbed into a much greater scheme. A faction called Ormus emerges from the shadows to menace the galaxy, and Jr. along with the other characters from Xenosaga, must stop them. The \'interesting\' thing about Ormus is that they are Christians. I don\'t mean a fantasy equivalent to Christianity either; they wear crosses and their leader speaks of the crucifixion of the messiah in one scene. The head bad-guy is a priest called \'The Patriarch\' (in the Japanese version of the game his name is \'Pope\'), and one of the final goals of the game is to kill the mad cleric. Needless to say, the hero who bares the mark of the beast and the villainous Christians make this game less-than-friendly to the Christian family. Aside from that, there a few other minor appropriateness issues. The game is as violent as most T-rated RPGs, and thus the battles consist of entering commands and watching the results. When some enemies die a bunch of red spheres fly into the air, but I can\'t tell if it is supposed to represent blood or if it is just some weird special effect. In any event, the game\'s rating-label cites \'blood and gore\' but I didn\'t see any except for one scene where a few drops of blood splatter against a wall after Albedo blows his own head off (this happens off-camera, thankfully) to demonstrate his ability to grow it back. This is really the only extremely-disturbing scene in the game. The last game was extremely bloody, and I was surprised how sanitary this one generally was. The game has no sexual content aside from Shion (the main character after Jr) wearing a shirt that shows some cleavage. However, there are some instances of profanity throughout the game. Like most RPGs, there is a system of magic and spells usable by the player. All in all this is an okay game with some serious gameplay flaws but with enough innovations to make up for them. I enjoyed my time with the game, but I respect that many of the people reading this will not due to the anti-Christian content. To be honest, if you avoid Xenosaga Episode II, you won\'t really be missing much, but fans of the first Xenosaga who don\'t mind the appropriateness issues and the long cutscenes will probably want to get this game.